While Octagon fans were busy clamoring over Chan Sung “The Korean Zombie” Jung’s rarely seen twister submission of Leonard Garcia at “UFC Fight Night 24,” Richard Hale broke out a slick submission of his own at Bellator 38. Saturday night’s event took place inside Harrah’s Tunica Hotel & Casino in Tunica, MS. While there were nine bouts on the fight card, Hale’s inverted triangle on Nik Fekete in the quarterfinals of Bellator’s light heavyweight tournament has rightfully hoarded the spotlight. 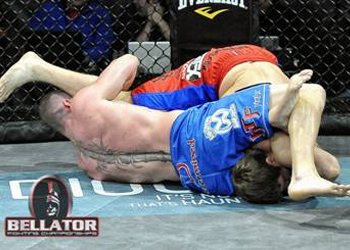 Lightweight Toby Imada popularized the maneuver in Bellator’s first season.